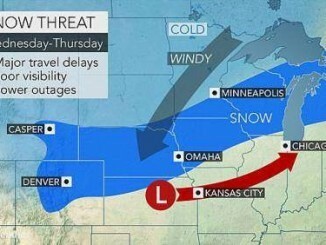 AccuWeather-(ENEWSPF)- AccuWeather reports as winds increase from a strengthening nor’easter, blizzard conditions will bring dangerous travel over the interior Northeast, while a wintry mix, rain and flooding continue to advance northward along the coast through Tuesday. The storm has forced a State of Emergency to declared in multiple states. Blizzard conditions with heavy snow, very low visibility and drifting snow will clog streets and highways from parts of central and eastern Pennsylvania and northwestern New jersey to much of Maine and New Brunswick. For thousands of miles of roads in the region, this will be an unusually cold storm for the middle of March. Much of the snow that falls will rapidly accumulate on the roads across the interior of the mid-Atlantic and New England. Some people could become stranded on area highways. The storm has already forced airlines to cancel thousands of flights. Be sure to call ahead before leaving for the airport. Blowing and drifting snow will also occur as far west as western Maryland and eastern West Virginia. 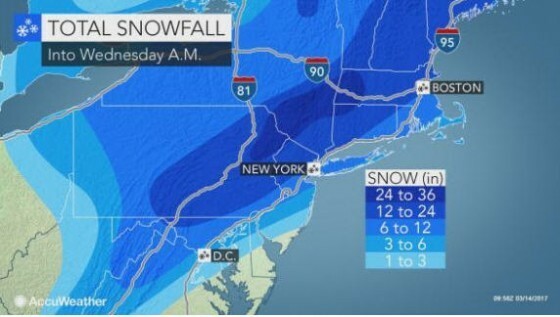 “In some locations in Pennsylvania, New York state and New England, snowfall from this storm could be the biggest March snowstorm since that of the 1993 March blizzard,” according to AccuWeather Chief Meteorologist Elliot Abrams. The heaviest snow is likely to fall near the I-81 corridor of Pennsylvania and the Northeast Extension of the Pennsylvania Turnpike to part of the New York Thruway in the Hudson Valley of New York, I-91 in northern Connecticut and Massachusetts and I-93 in New Hampshire. In this zone, from 1 to 2 feet of snow can pile up with locally higher amounts possible. Drifts up to several feet are likely. Thunder and lightning can accompany the snow in some locations. A combination of rain, ice and snow will straddle the metro areas from Washington, D.C., to Baltimore, Philadelphia, New York City, Boston and Providence, Rhode, Island. Rain will fall on the southeastern flank of these cities, while wintry precipitation holds on over the northern and western suburbs for the storm’s duration. The mixing will cap the snowfall, ending the threat of blowing and drifting snow, and will cut down total snowfall accumulation. Regardless, travel will still be treacherous in and around the metro areas. While the storm has or will continue to transition to rain along a large part of coastal Northeast, coastal flooding and increasing winds will cause more trouble. As the storm intensifies, winds will ramp up along the coast and expand inland. Wind gusts will frequent 40 to 60 mph at the height of the storm, which cannot only create blizzard conditions but may also break tree limbs and threaten sporadic power outages. Gusts can be higher right on the coast and over coastal waters. During much of the storm, northeasterly winds will pull ocean water toward the coast and create rough surf from Virginia to Maine. This effect will cause tides to run 1-2 feet above normal and can result in coastal flooding at times of high tide. Beach erosion will occur as well. Since the storm is likely to maintain its forward speed, the period of coastal flooding and beach erosion will be relatively brief. Strong onshore winds, coastal flooding and beach erosion will diminish from south to north as the storm moves along and winds blow offshore Tuesday night and Wednesday. 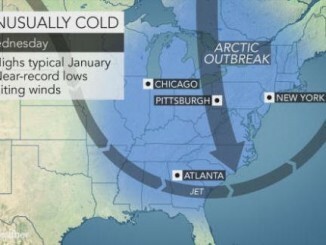 For those that lose power, cold air with wind more typical of the middle of January will settle in behind the storm. .